How many of you have ever wanted to sleep in a hotel made out of ice? Yes, this is something right out of a fairytale. Just a short drive away in downtown Quebec City, Canada there is a must see attraction every year called the Hotel De Glace. Even if you don’t want to sleep in this hotel made completely of ice, this is a must see. It originally opened to the public in 2001 and has since then attracted thousands of people to see this ice cold marvel. 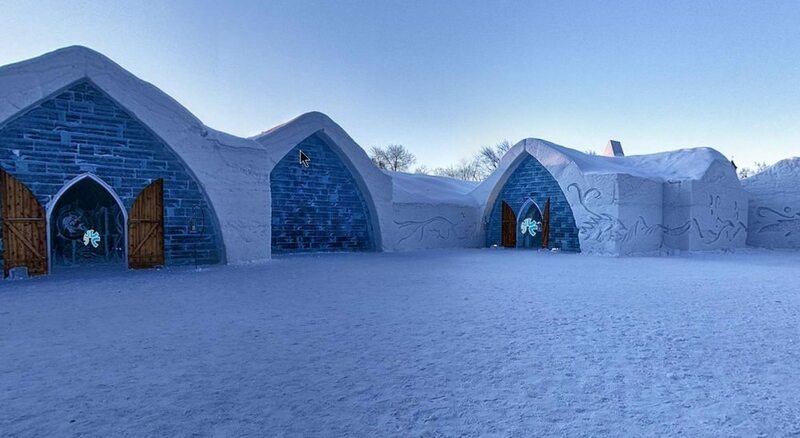 The Hotel De Glace is open to the public from January 4th until March 28th each year. There are 44 rooms and suites in this hotel. Each one is unique and will give you a wonderful experience sleeping over. Are there Tour Packages available? Yes, There are 4 main tour packages that are available. The tours range fro $9.25 to $45.75 depending on whether you are an adult or child. You can book online for your tours and your stay at the hotel too. Each year the Hotel De Glace redesigns to amaze its customers with something new and fresh to experience. For 2016 season of Hotel De Glace they are going with a river theme. The main artistic director is capturing the beauty of the rivers, frozen lakes and natural flowing movement of nature’s ever changing and flowing water. There are five guest packages that you can take advantage of including the wedding package. This package lets you get into the cold with a nordic sleeping bag, sparkling cider cocktails served in ice glasses, a four-course dinner, hot tubs and sauna under the arctic stars, breakfast in the morning and we very nice welcome kit. If you are a little more adventurous and want to take a walk on the wild side, this is the package for you. You get the same amenities in the discovery package, but the adventure comes in with a private shuttle service that sets you back in time before motorized cars. Dogsledding through the snowy paths of Quebec with 6 huskies working hard to get you to and fro. This is the package for the lovers in mind. All set around creating the most romantic getaway with just a touch of cold chill from your ice castle room. A room at the Four Points by Sheraton Quebec on the same night as your stay at Hotel De Glace and a romantic four-course dinner at Le Dijon. This package is the top of the line with a themed suite with drinks served in ice flutes, breakfast at Le Dijon, a night at HOtel-Musee Premieres Nations, Breakfast and a personal valet. Don’t forget the hot tubs and sauna under the nordic stars. Imagine your wedding set in a beautifully masterfully carved ice chapel with majestic snow vaults, ice candle holders, horse drawn sleigh ride, all set in a simple majestic setting inside the Hotel De Glace.